Cheers mr.brown. I've got a new old stock set of Prothane ones which I think I'll now go without. Being a dumb newbie, what's the difference with the 16v mounts? Just harder material? 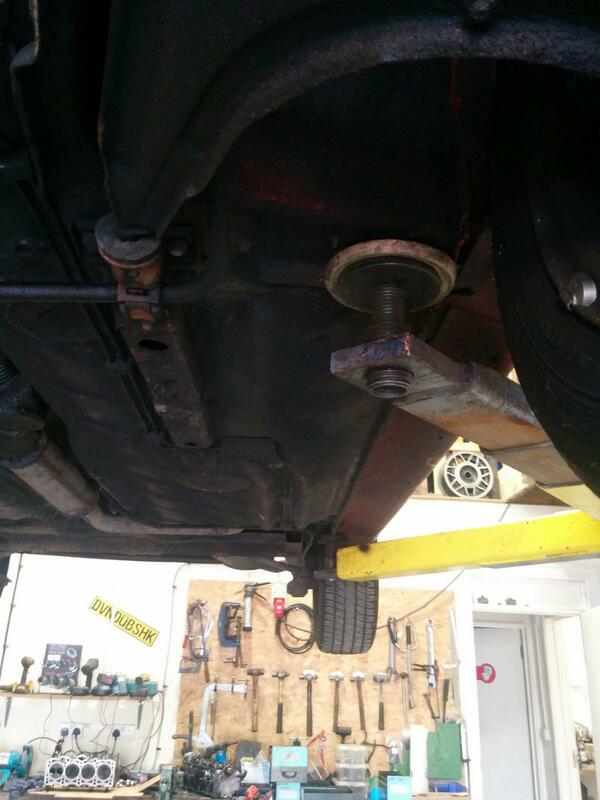 DrJ wrote: what's the difference with the 16v mounts? Just harder material? I think so, there was an old thread on Vortex where someone quoted the Shore(?) or durometer ratings. From the factory, I think it may only be the 16v side engine mount that is different - due to the extra weight of the 16v head presumably. If you look in the link I posted though - it seems that mk1 Autohaus are manufacturing all the mounts in a harder material. Just got this back, pictures to come. I laid her up over the worst of the winter, and intended on taxing and MOTing her at the start of this month. That turned into three weeks at the local garage and an absolute saga. Knew she needed new shoes, so fitted a pair of dunlops to the front. Rears still had plenty of tread and were matching decent brands. Went in for MOT and failed on emissions, headlight dash warning lamp blown, high idle and a few fiddly little things. Fiddly things easily sorted (plastic trim peeling away etc), started on the emissions. I knew the Pierburg was f****d as the idle was about 1600 and the second butterfly never opened. 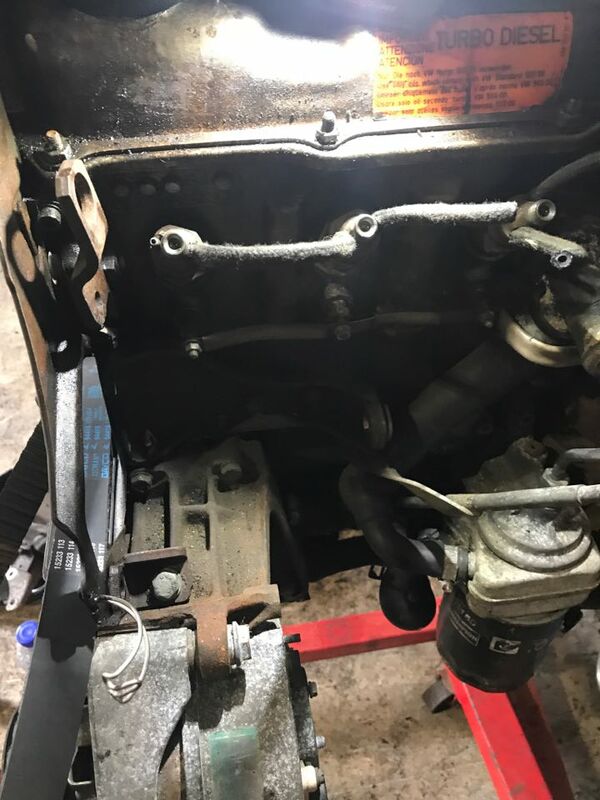 My garage here in Cardiff are very good and enjoy working on old motors (they've been using it to teach the young lad about vacuum advance), so they stripped down and rebuilt the carb. 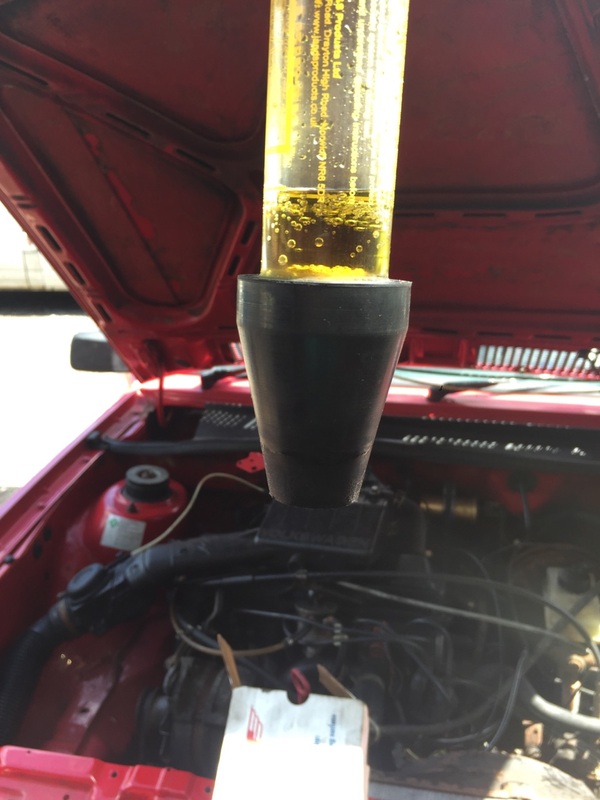 This sorted the idle, autochoke and second butterfly, but the emissions were well out. This also not solved by full service. Looked at the rotor arm and contacts and they were shot all to hell. The whole dizzy shaft was wobbling side to side about 3-4mm, so contact was not being made. 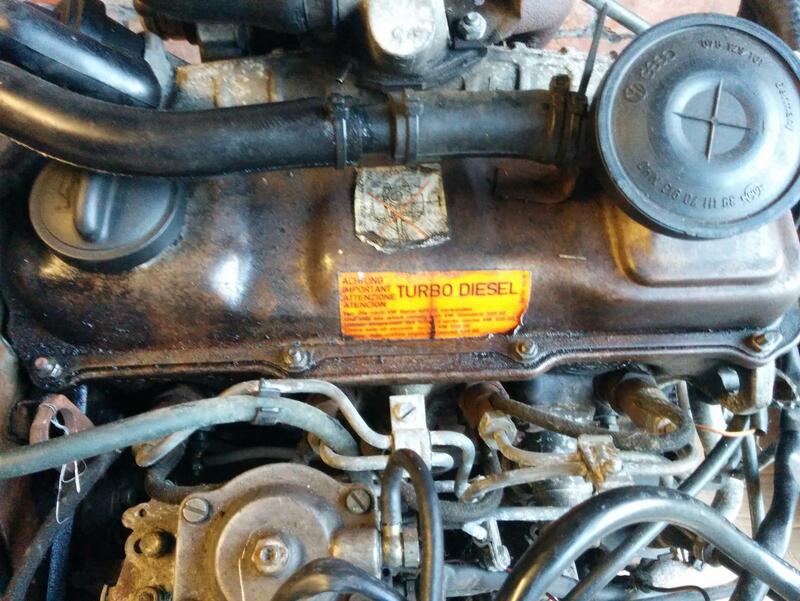 Essentially the cars been running on half a dodgy carb with choke on all the time, and 30% spark. No wonder she was rough and slow. Cue search for a new dizzy. Ended up getting a cheapy one off GSF, and I'll get the original remanufactured in time. 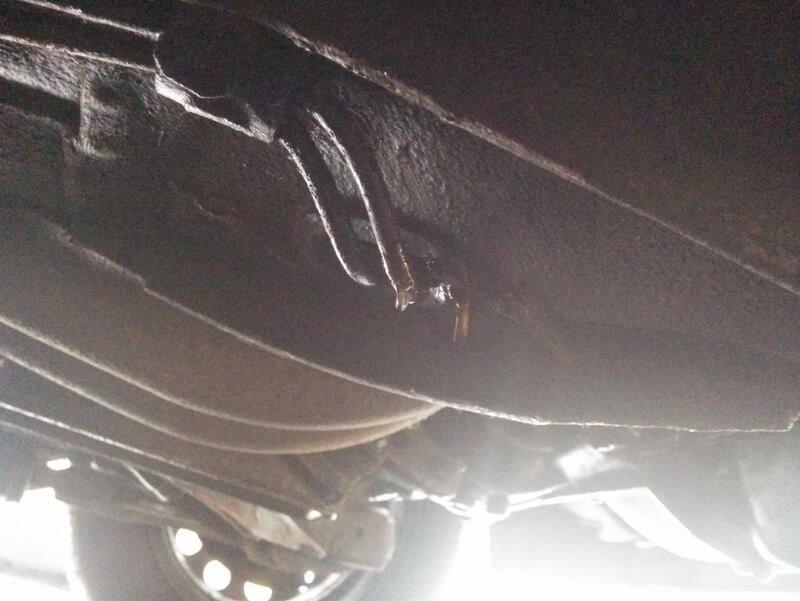 Garage kindly put on a fresh coil they had going spare, and that sorted her emissions right out. Full service done including (what looked like original) gearbox oil and new cam cover gasket and timing belt, and we're looking at a win. Then we discovered the little light for the headlight warning is not an LED, that would be too simple, but a tiny bulb rated at 12v. Discontinued part at VW. No motor factors make them, but luckily there's a company on evilBay that do the same bulb for the T25 campers at £~5. Sorted. Cleaned and waxoyled fuel lines all round. New brakes discs and pads at front. She now has a years test, tax, a fresh tank of 99 RON and goes like stink. Time to enjoy in the sun. Re. Your distributor, it will be well worth either reconditioning your original one with Bosch parts / replacing it with a new Bosch one. The GSF ones are cheap copies of the Bosch units, which are great to use as a stop-gap spare, which I did once. 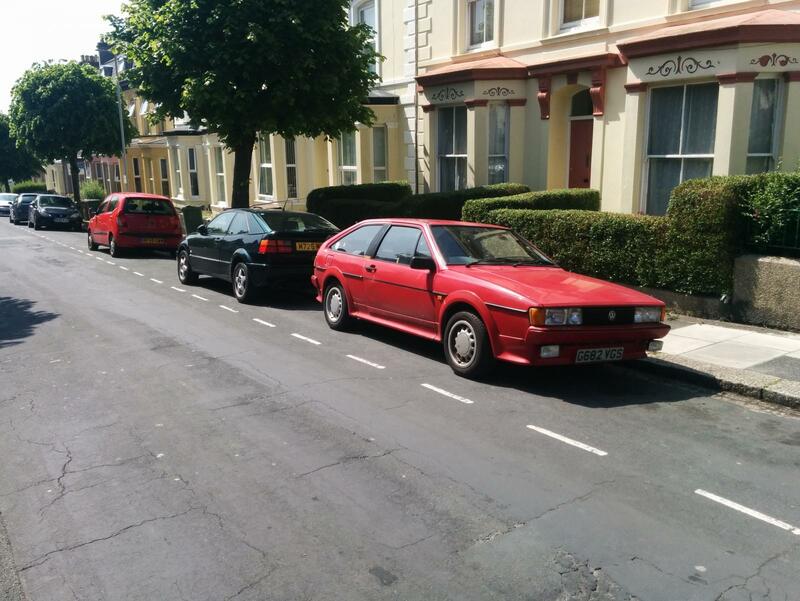 However, the performance of the car was noticeably better with the original back in. Yeah that's my plan, I read that the cheap GSF ones aren't up to scratch. Plan to get the Bosch original reconditioned and then fit it when I fit the g-grind cam so that they're all timed up properly. 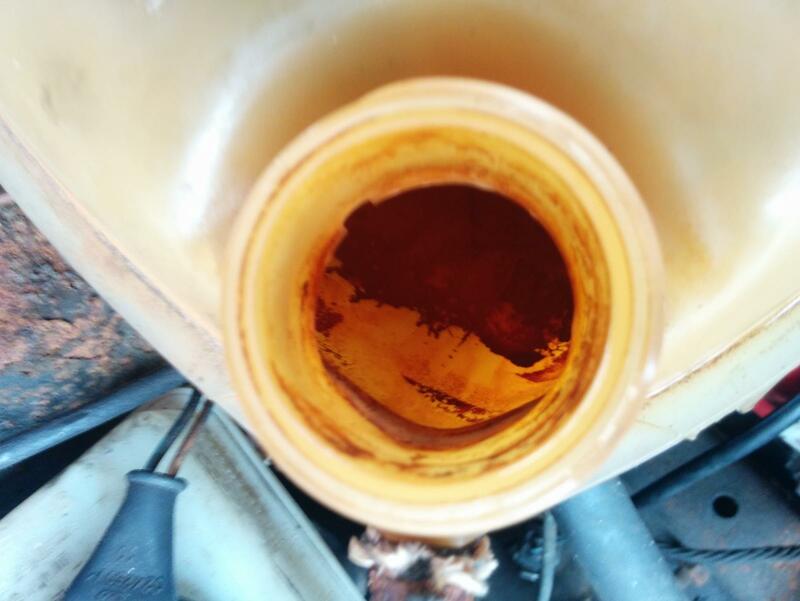 Shortly after getting the Scirocco back with MOT, it started leaving puddles of oil as dominant territory markers again. 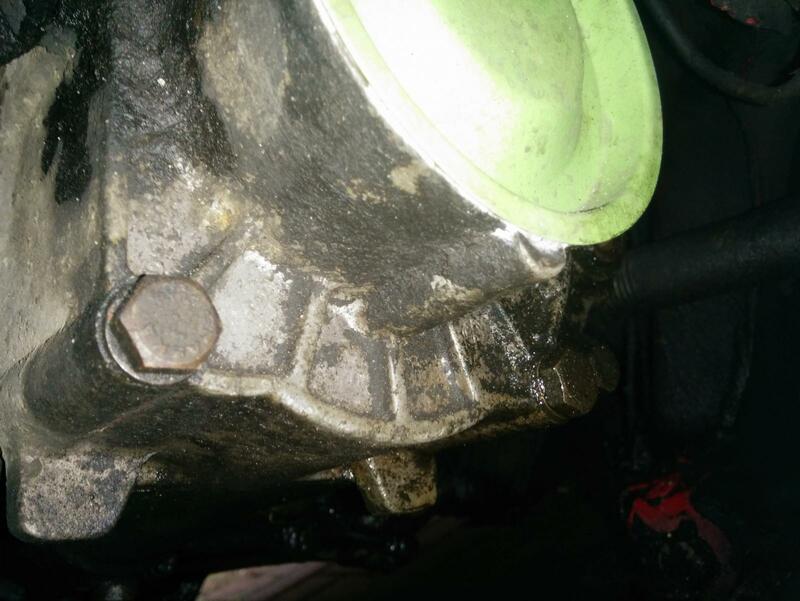 The gearbox had been whining for a while, and the oil appeared to be dripping from it. 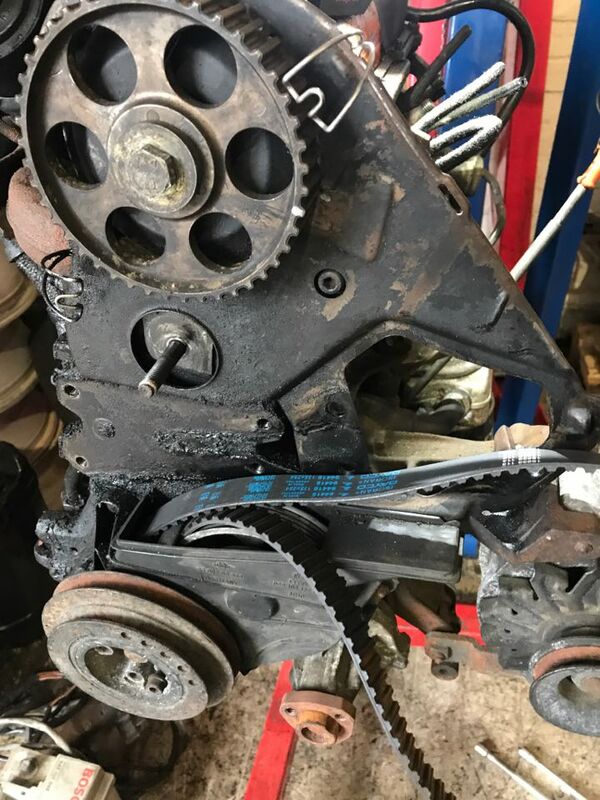 This gearbox is unlikely to be the car's original, as the box code 4T is assigned to MK1 golf diesels and some others. Mine's been whining away merrily, and it turns out because at some point someone's holed the metal endcap and it was bleeding out it's gearbox oil. Following that it had two breakdowns. It was being used as a daily driver, and was running ok, but kept having odd moments. About 1/10 times when started it would just turn over, not catch and then try and start when you turn the ignition off. Fiddling with the dizzy would make it run, so investigated with a timing light. The ignition was 6 deg too retarded, so timed it properly but it was still being an arse. Probably the cheapy GSF pattern distributors fault. Fuel economy was down the pan, pinking every now and then at random, and generally being untrustworthy. It therefore got stuck my lockup until I could face spending money on it again. I built up a spare Weber card I had for it in the meantime and went out and bought a boring daily. 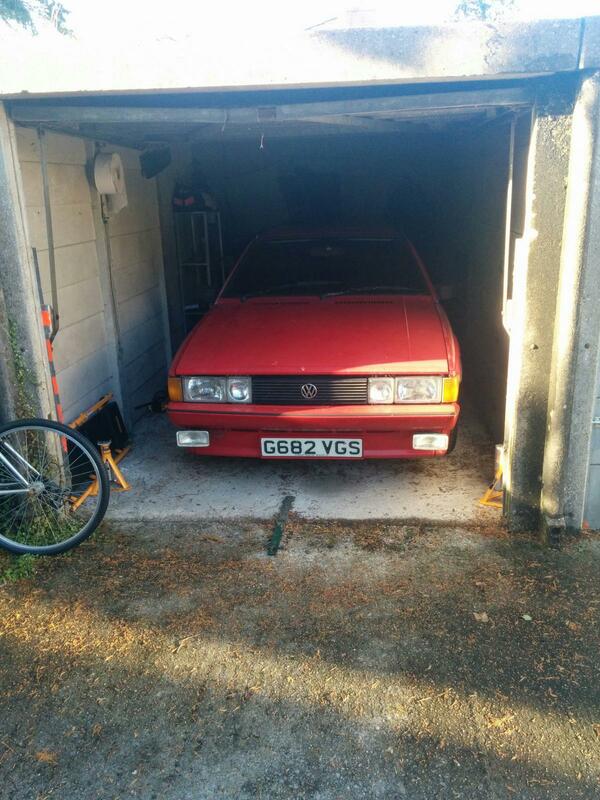 Fast forward to May this year, when I pulled the Scirocco out of winter storage. Bunged £20 of 98 RON in, which it promptly wazzed all over my lock up floor. 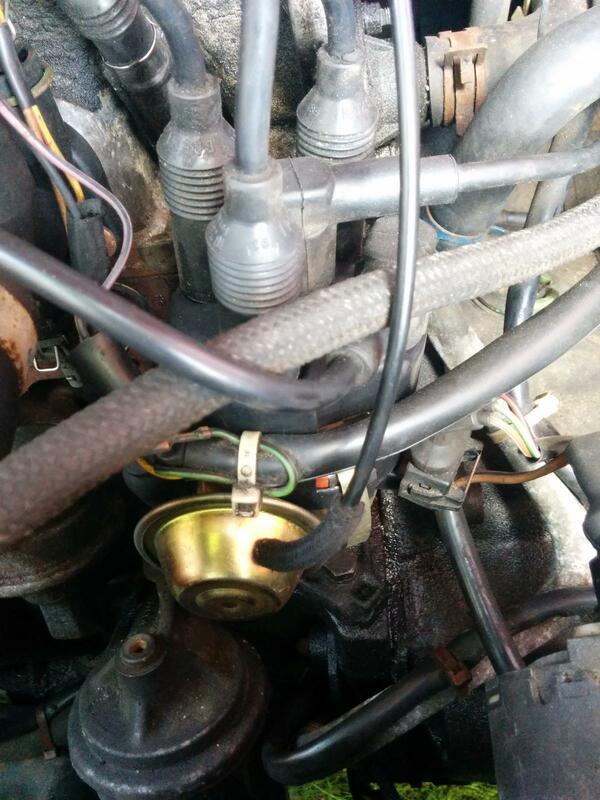 The hard fuel line and had rusted and pinholed where it runs through the subframe. On the two poster, cut out the dodgy fuel line and replaced with hose. Rest of the underside looks alright. Old Pierburg never really worked well, so got replaced with this Weber 32/34 which I picked up on ebay for £40 a couple of years ago with all the fitting kit. K-seal, not even once kids! Initially thought it was the expansion cap playing up and not holding pressure. New one purchased. Spent a nice couple of days tinkering and succeeded in breaking it further. 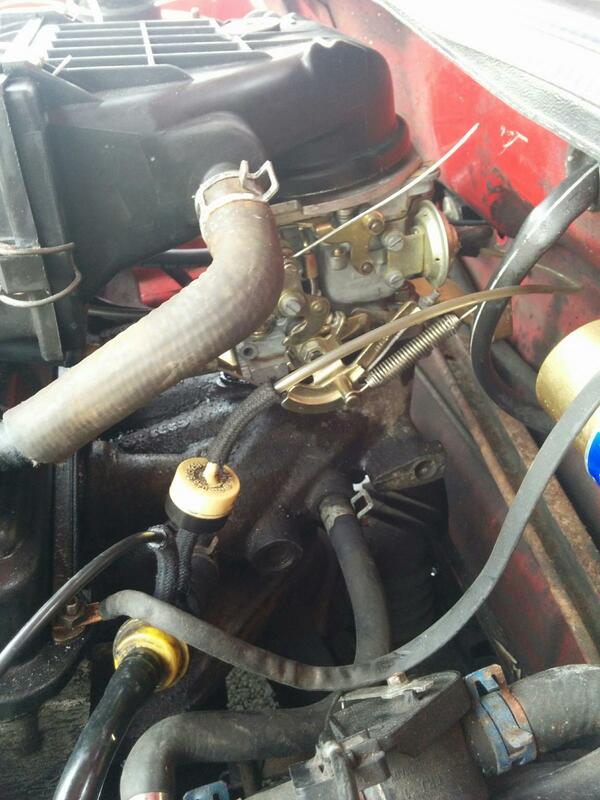 The carb fuelling was now sort of set up (it was idling without the need for a clothes peg on the choke). First time I'd played with a carb in a long time, and no guide so was fiddling by ear. It is pinking/ knocking at idle, so borrowed a timing light. Gave it another flush and took the flange off the block to get into the water jacket. Found a younger cousin while out and about. 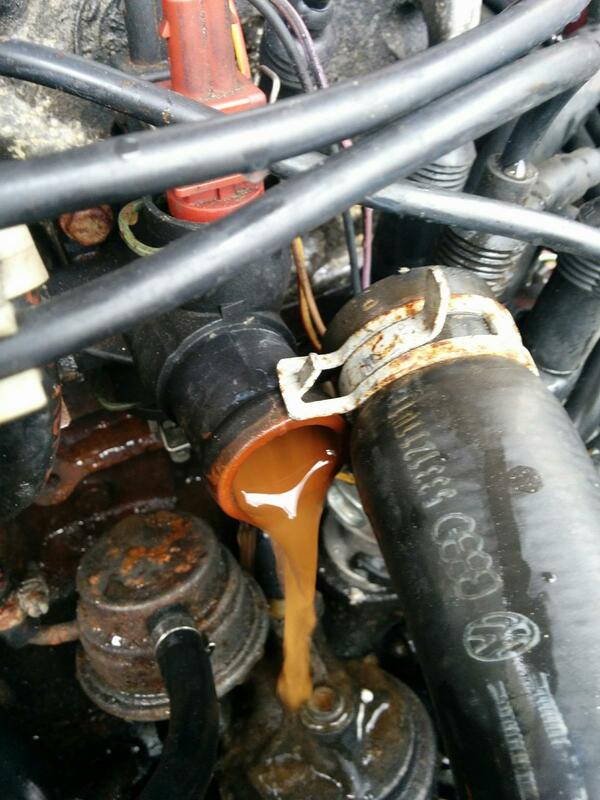 Coolant was for a while cooling the engine, not the tarmac. GSF's finest o-ring was fairly poor and the one on the flange was in OK nick (must have just seated it poorly) so smeared a bead of blue gasket-silicon-mush around and now was watertight. Ran her up to a mate's garage to time up properly. No shots of this because hands full. However only interesting bit I'll shamelessly copy someone else's picture. It had been timed to the little dot in the centre... TDC. VAG in their wisdom set it to be tuned to 6 deg before TDC with vacuum advance disconnected. 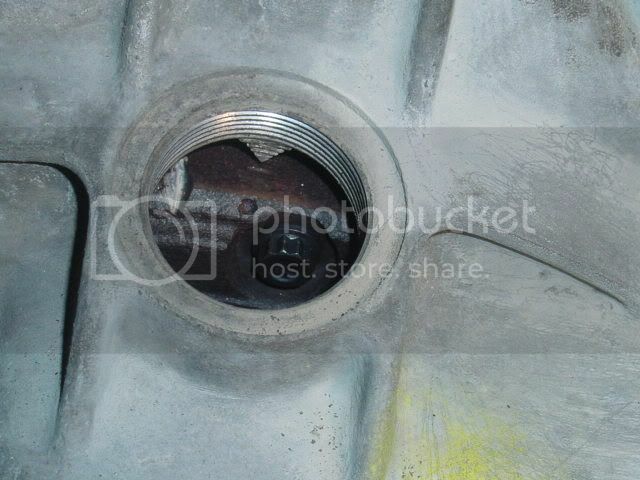 There's a big notch on the flywheel to the left of image which is this. Properly timed up she now ran sweetly. And then around July, it died in a blaze of head gasket glory. It ran well for a few hundred miles then started overheating again. The thermostat was replaced, but no improvement. Difficult to know when this happened. It may be pinking due to my incompetent timing, it may be the k-seal has been hiding it a while and it's been lurking behind all the other engine faults. 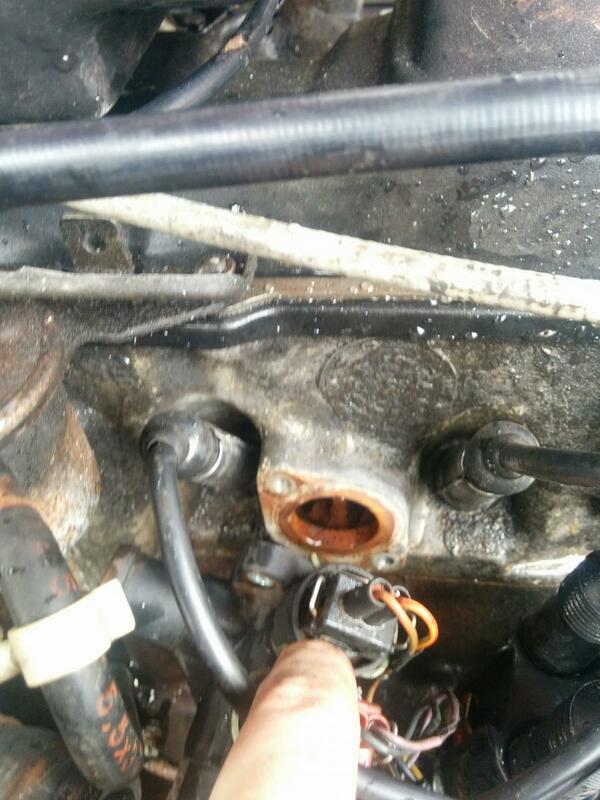 Compression was good on all cylinders, but one of the spark plugs was rusty. At this point I was moving 150 miles and starting a new job, so I swore at it, wanged it in the lockup and walked away. 1. 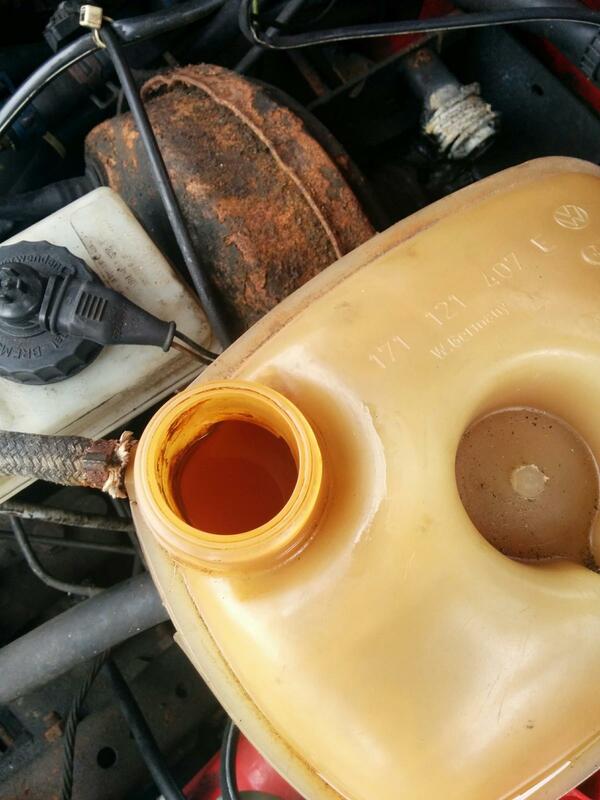 If the spark plug was rusty, the bore may also be. Not going to know without pulling the head, but this may turn into a full engine rebuild (which I may do anyway to keep it as a spare). 2. 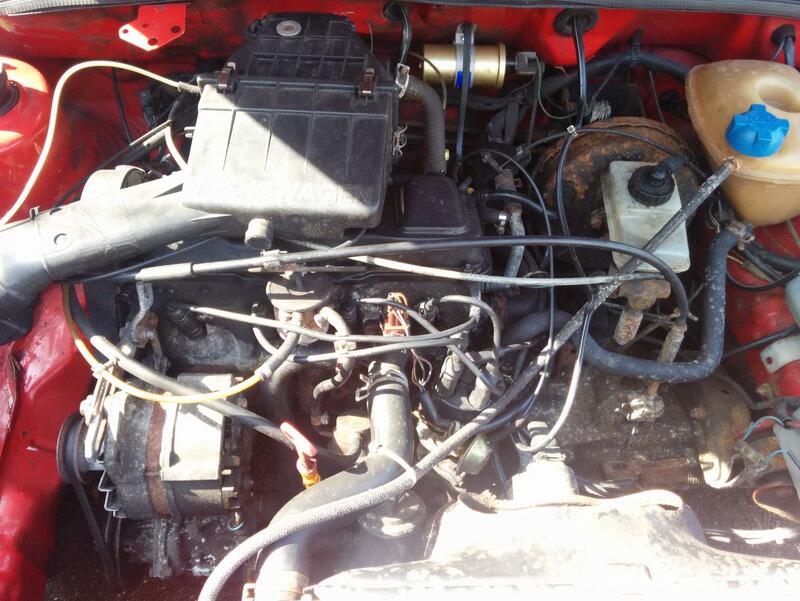 Even rebuilt the stock 1.8 carb makes 90hp on a good day. It does sound lovely, but has caused me so many headaches so far. Considered potential engines. Lots of people have put 16v KRs in running on carbs and a fair few 1.8Ts. I'd always hoped to do a G60 conversion and make the car VW should have, but those engines now cost more than the rest of G682. I decided I wanted to be able to use this as a proper daily. 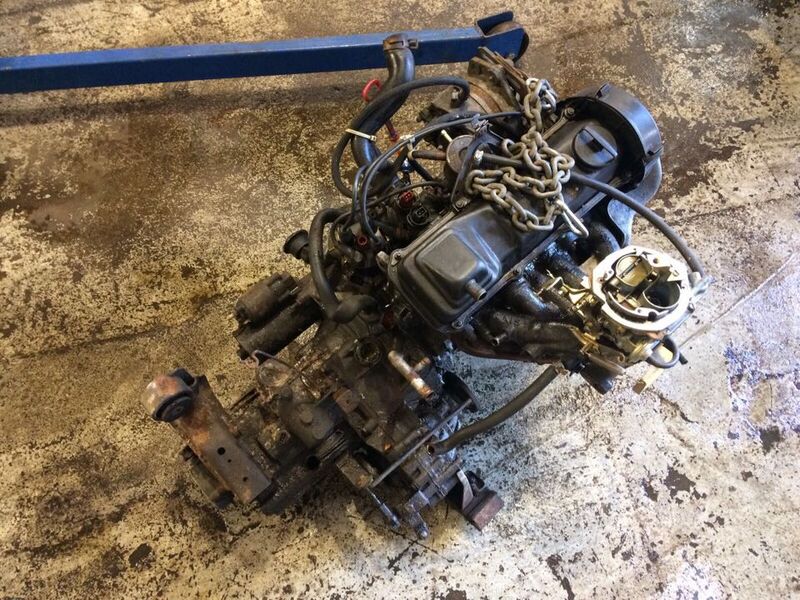 After discussion with my mechanic friend, we agreed upon a TDI conversion, aiming for an older VW mechanical fuel injection lump like a 1.9 1z or 1.6 SB. 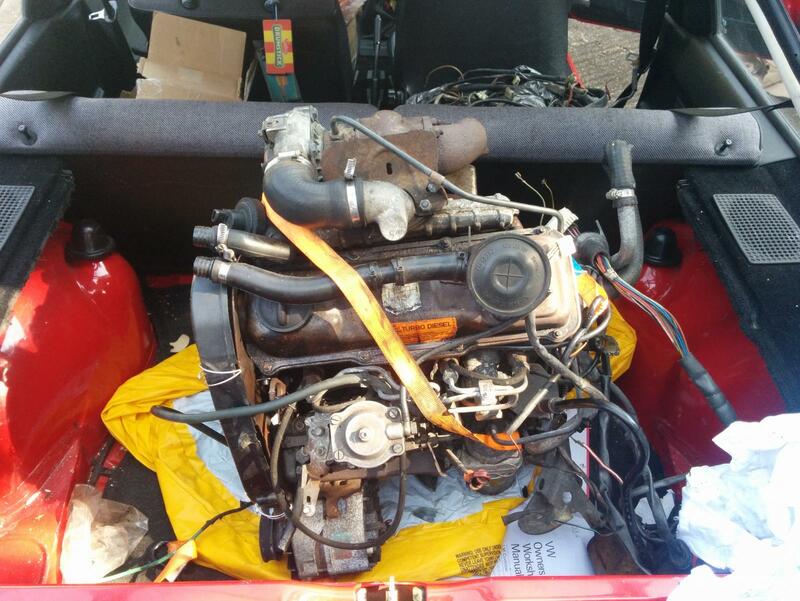 Started idly browsing potential engine donors on eBay and Gumtree and saving money (as T4 owners also like this engine for conversions), when someone on another forum offered a nearly free early Sharan. Pretty doggy and an MOT failure. 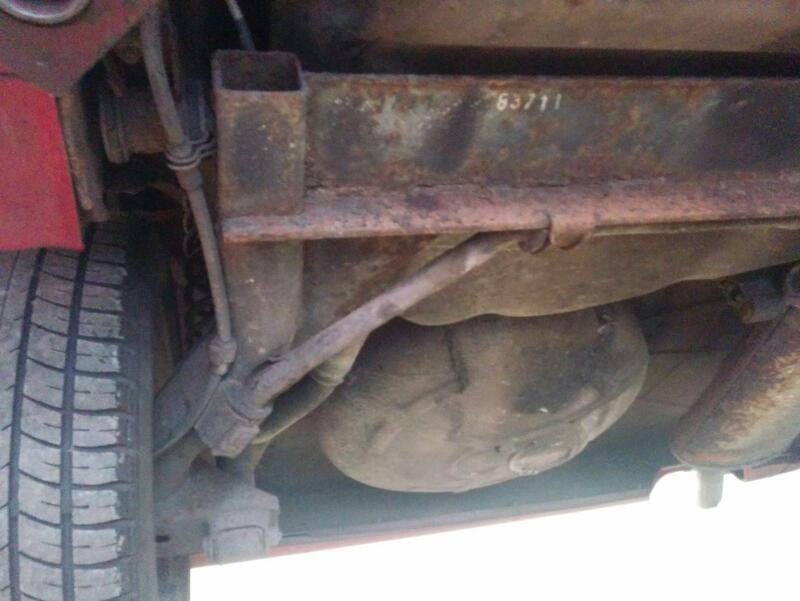 It failed on the exhaust and rear fog light, which would have been easy fixes, but the advisories were also for suspension and brake lines so the owner wanted shot. It's cosmetically awful, but otherwise relatively well cared for. It came with all it's service history, including a legal dispute. Sometime in 2006 VW did a cambelt, tensioner and major service. Not long after it dropped a valve and the engine was written off. There followed a period where disagreements were had over whether it represented poor quality work. 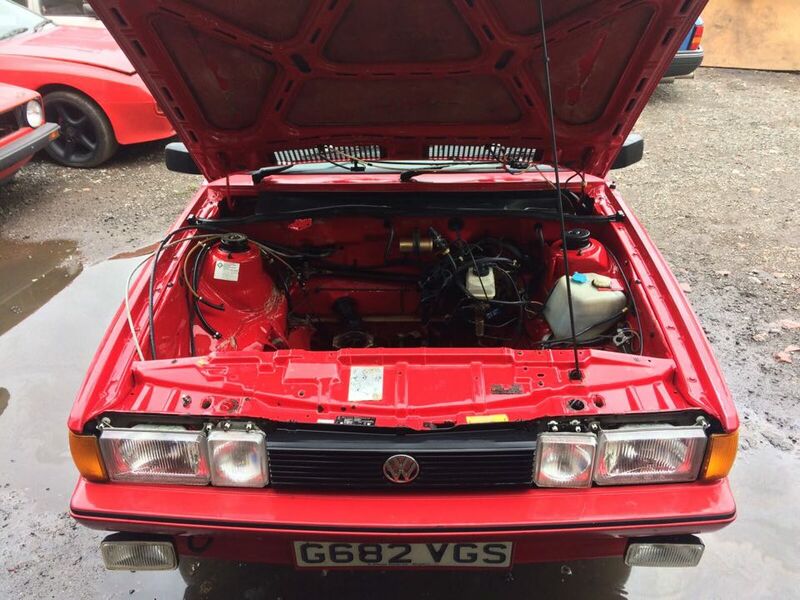 Practical upshot; it had a new engine 50,000 miles ago, and it's an AFN; the last pre-pd diesel VW made in these models with the best tune, bigger injectors, a VNT turbo and stronger rod bearings. Good organ donor. 1. 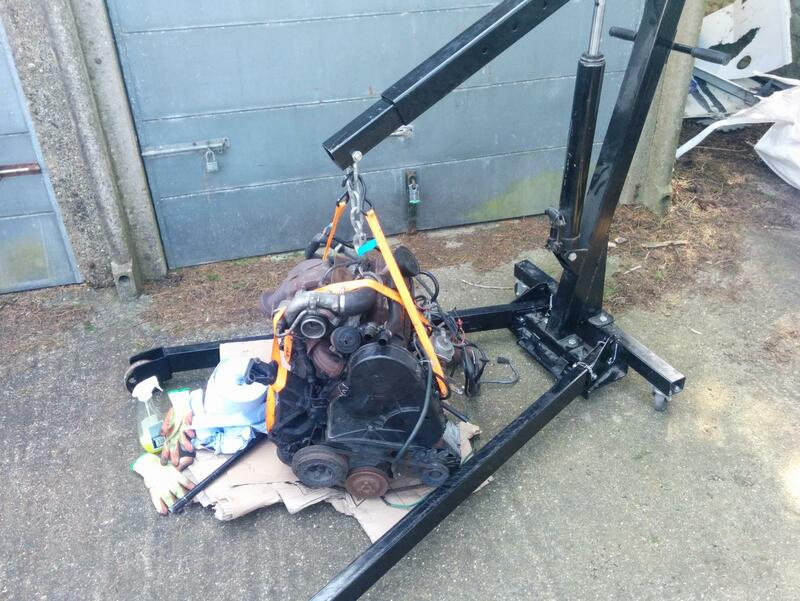 Will off the shelf engine conversion mounts fit, or does it need special ones fabricating? 2. Will the AFN fuel pump run without the ECU. If yes, like an old 1.6 SB, I think it's just plug and play with the loom. If no, we either swap the pump or splice the loom. 3. Connecting the fuel piping from the old petrol tank to the new diesel block mounted pump. 4. Throttle system - we think it's fly by wire so we may have to retain the ECU anyway. 5. As an early pre-pd lump we hope it will bolt to the original 020 4T box without much fuss. 6. Dash clocks... cross that bridge when I come to it. And I imagine a host of others. Advice welcomed! AFN is an easy one to delete the ECU, loads on the internet regarding swapping the pump for the mechanical one off a landrover tdi200/300. 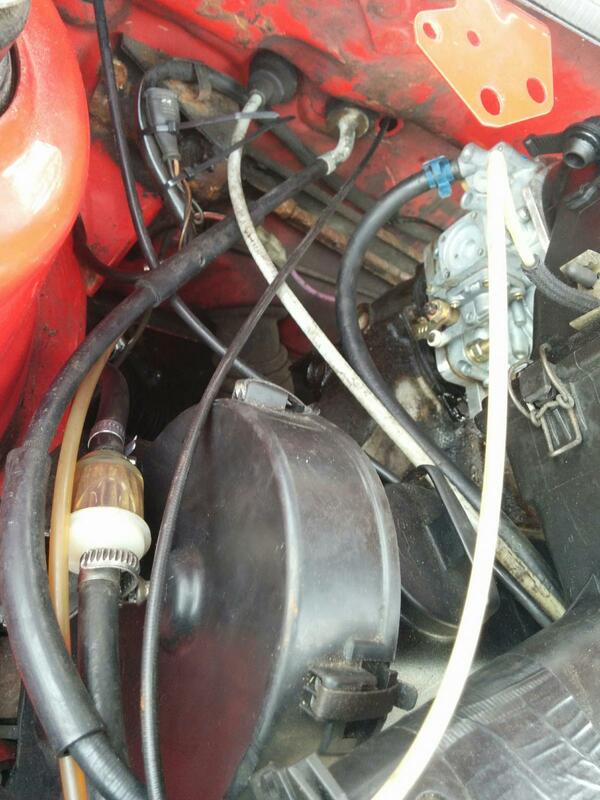 Apparently the engine on the mechanical pump to run only needs four or five wires including the starter motor lead and the alternator wires. AFN with a later tdi 170 manifold , uprated injetors and a decent intercooler will apparently easily make 160 bhp plus. Ta Sabre for the advice. I looked into the tdi200/300 conversions, but have decided to keep it e-tdi rather than m-tdi for the time being. The mate who will be working on the conversion has done a similar one with an AHU lump (90bhp), as well as a few T4 conversions. Current plan is to keep the ECU and run it stock to iron out issues. We'll splice the loom to keep the current fuse board (helped by the fact I have a spare and a stock of relays I pulled out of the breaker GTX). 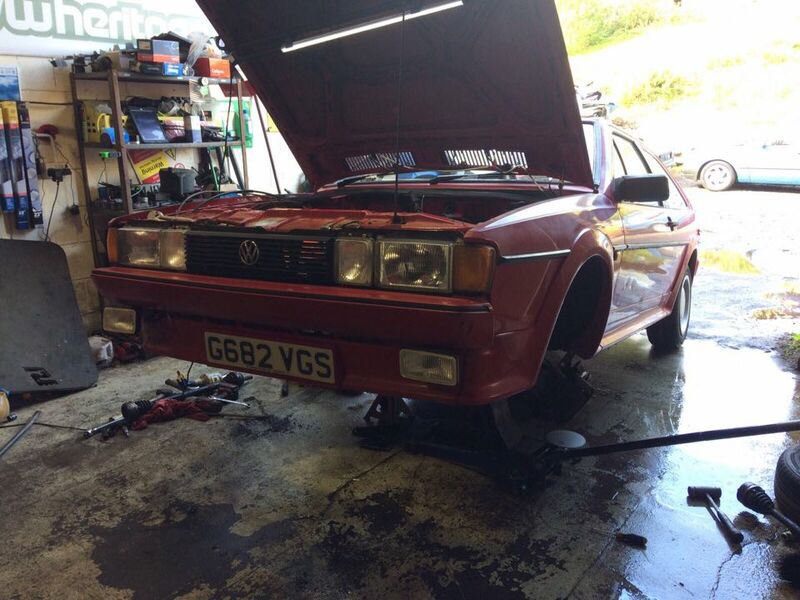 We'll adapt the current throttle pedal to accomodate a fly-by-wire potentiometer, and install the Sharan's immobiliser system into the Scirocco key and locks. 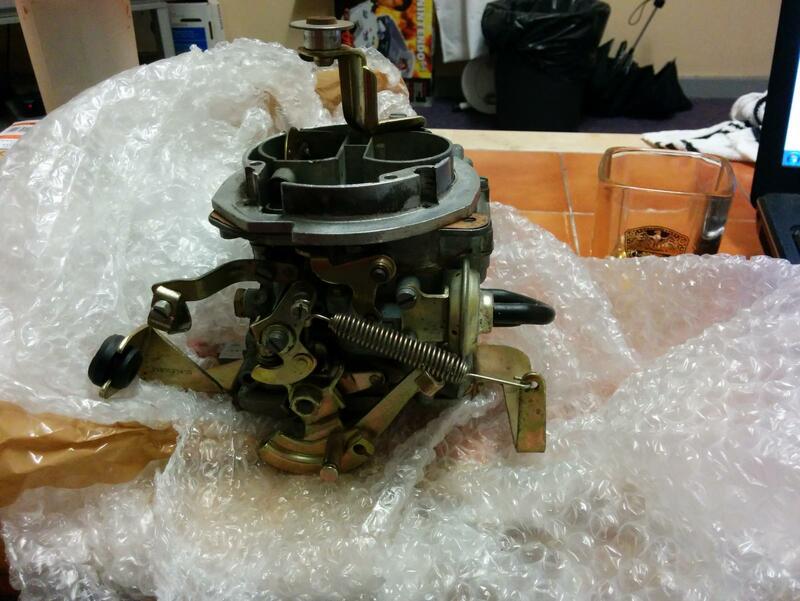 The current gearbox (4T code) will be used while it's in stock base tune (110bhp with 170lb/ft) and iron out issues. 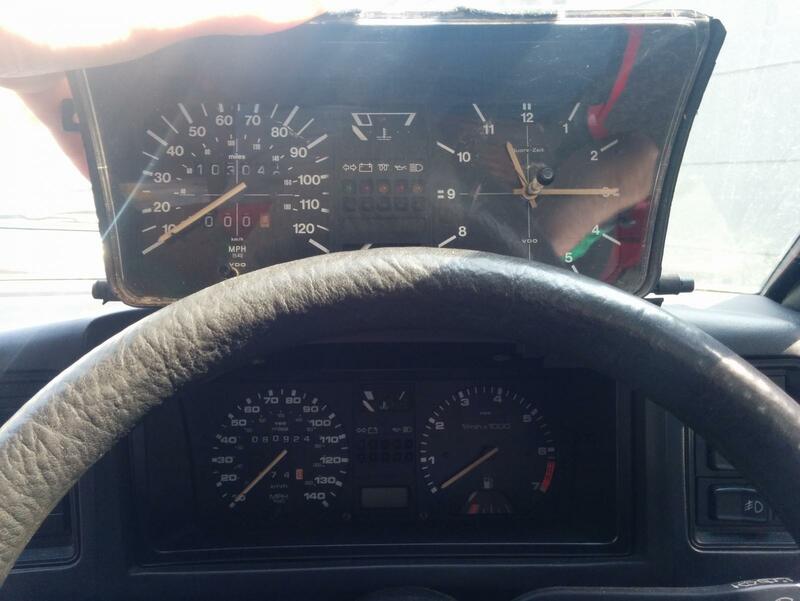 I'll be using a set of diesel clocks from an early caddy or golf/passat to get the glowplug circuit. Eventually once faults are found and fixed I'll do chipping/ uprated injectors/ manifold and drop in a cable 02a or an 02M with a cable conversion. I should really update on here more often. Plans for this changed (as they so often do) but I still have it. 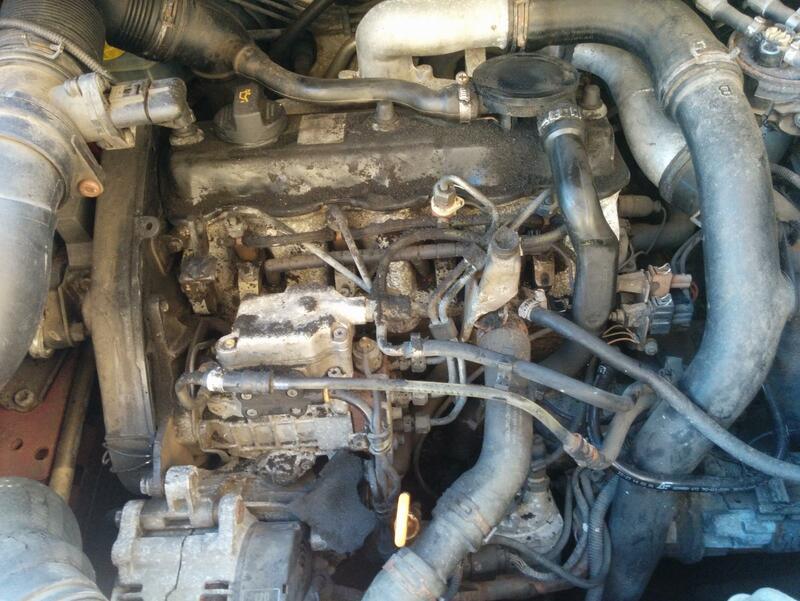 Sharan was broken for it's engine, but then I heard about a cheap 1.6td engine that had been sat in his garage for a few years. Bit of an unknown quantity, but at a price I couldn't refuse. So not sure what this has come out of, potentially an early Golf GTD or Jetta. 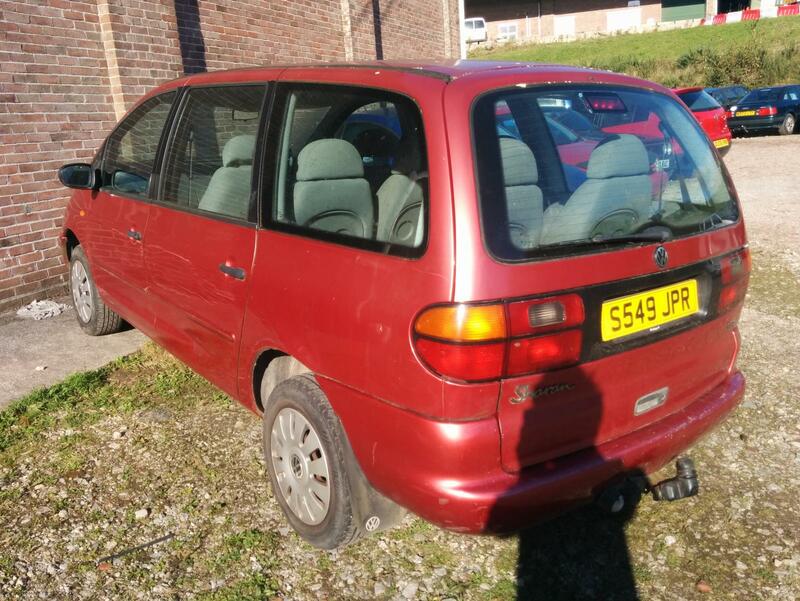 It's lower powered than the SB, which is a bit of a shame (and considerably lower than the AFN from the Sharan). This is apparently down to being fitted with an air-cooled turbo running lower boost pressure without an intercooler compared to the intercooled water-cooled turbo on the SB. This is now going in as it's significantly easier. It uses the same engine mount points, no ECU concerns etc... The AFN will be a spare/ backup. The only issue is that it needs a dash with a glow plug light to work with the relays on the fuseboard. 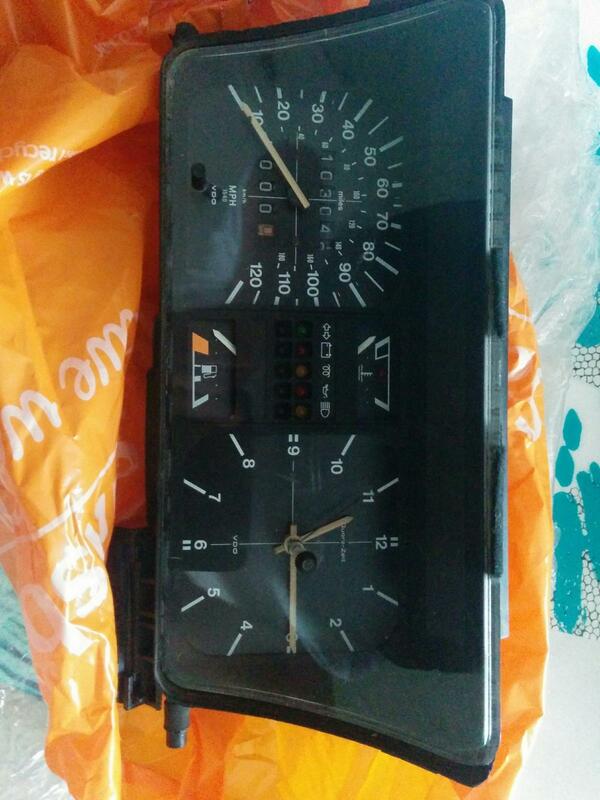 Some ebaying has provided this from a Mk1 Caddy. 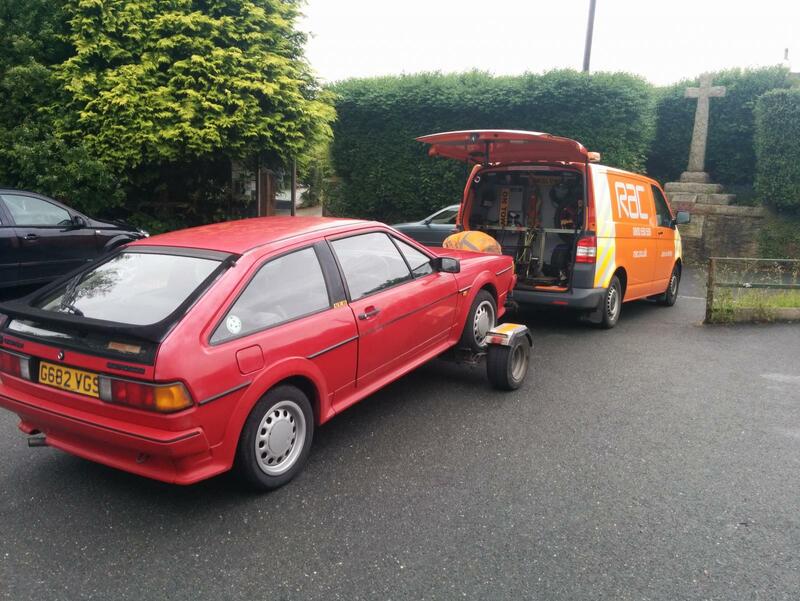 With the car in a lock-up 150 miles from my house I set off for a long weekend prepping it for conversion. 1.6TD lump was loaded in the back of my Octavia. Unloaded. G682 sat for 9 months in my lockup, being rolled every couple of months to stop the brakes sticking. On trying to start it with a fresh battery and pez it was having none of it. Couldn't even bump start. I think water from the HGF has got into the bores as I feared and seized it. I'll do a post-mortem after the conversion. Last shot of the original engine 1.8 8v in situ. I was reminded why I bought this car, as apart from the front valence there's so little rot. The required change of clocks. Going up in the world. This is more so I have an accurate track of it's mileage. 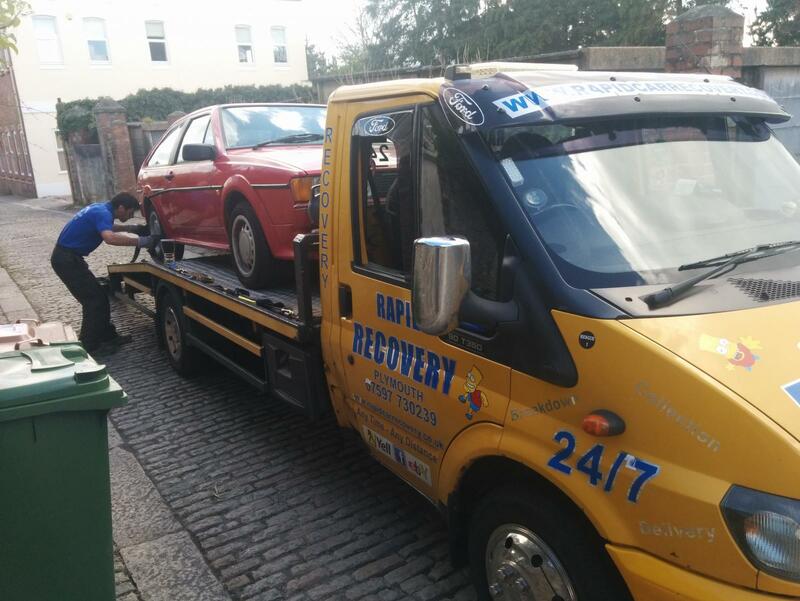 1.6TD was loaded into the back of G682, which was loaded onto a shagged DI Transit flatbed for the tow to my local mechanic mate. 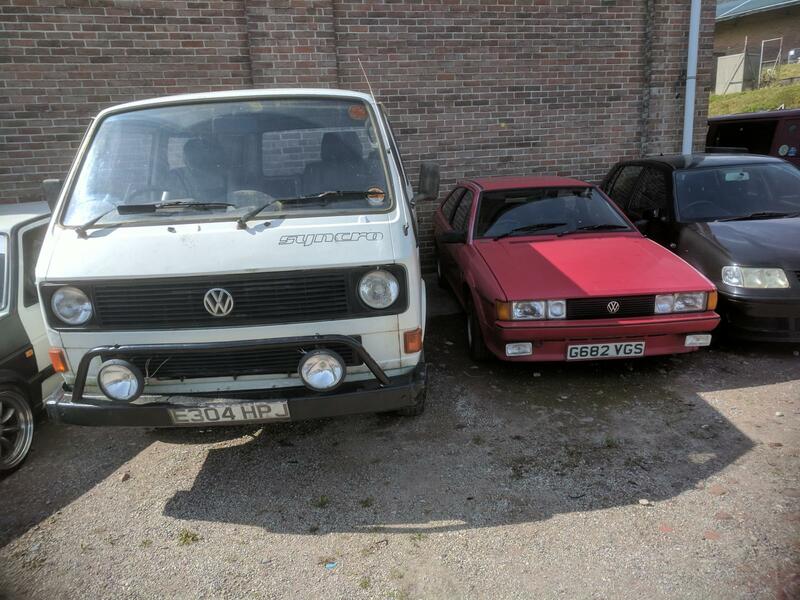 She then sat for a while waiting for my mate to have some free time, luckily with this lovely old Syncro for company, but now she's had the old engine pulled out ready for a new lease of life. 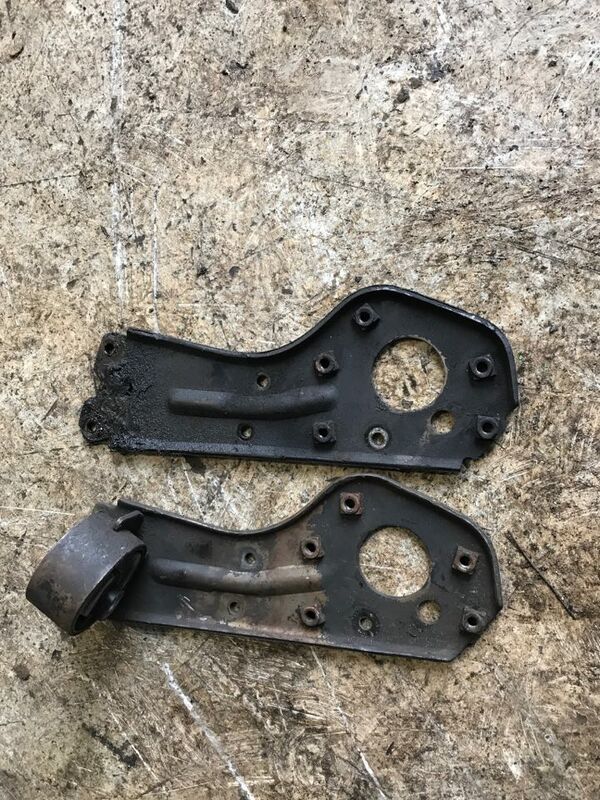 The 1.6td SB required a slightly different engine mount from a mk2 golf gtd (eBay again) which took some time and slowed things up. This then required the removal of the (BOSCH!) fuel pump to fit. Glow plugs, cam belt and tensioner at the same time. And that's up to speed. Electrics currently being gradually chipped away at. It'll also require (get) a Merc sprinter intercooler and custom exhaust (2.5"), but getting closer.